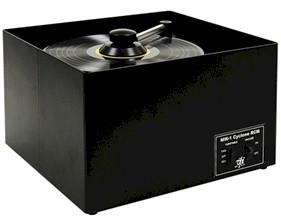 The latest record cleaning machine from VPI is the Cyclone. The Cyclone takes the HW-16.5 to the next level. forward and reverse platter rotation makes cleaning even easier. And the Cyclone is about 20dB quieter! We firmly believe that a record cleaning machine will enhance your vinyl experience on the same level as getting a new cartridge. It is critical to have clean records - both so you can hear them at their best and to preserve the vinyl and your cartridge from wear. A good cleaning machine is worth its weight in vinyl!!! We recommend TTVJ Vinyl Zyme record cleaning solution with all VPI record cleaners.